Emperor Constantine‘s mother, Helena, during her pilgrimage to Jerusalem, had a dream that led her to find not only the original True Cross, but the hole that the cross had stood in, the tomb, and a bit of rock that blocked the tomb (this, around 325 CE). And they all happened to be in a very compact area that could conveniently be covered with a single building. Clever woman, that. The last piece of our tour of Jerusalem was to this building. When I was looking for links to include with this story, I found this, a travel site that describes the church. Anti-climatic, gloomy, dark, and noisy with visitors. I guess I expected to see a place that was somehow peaceful, reverent, meditative, and…clean. Instead, I felt like I was in a low-rent amusement park, one that had dreams of being a world class zoo but only had the means to stake two donkeys on a rope. To their credit, you did have to leave the building to buy trinkets and smoked turkey legs. I’ve read enough history that I knew about the divisions in this place, and read the above-quoted Figes book a few days before my trip. Our guide took us through the site, starting with the altars. Two altars. One, a simple table covered with a plain white cloth, simple walls, and a portrait of Jesus. 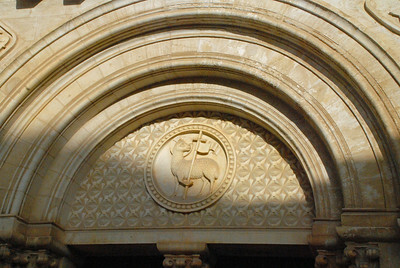 This is on the Roman (Latin) side. And a few feet to the left, past a dividing wall, you are in the Greek Orthodox side, which is every inch festooned with gold and glitter. The line of people waiting, inching forward. 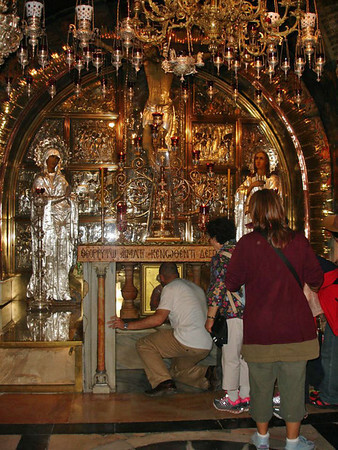 As you come to the gilt altar, you can bend and reach under the table, touching (and some people, kissing) a hole in the rock that is supposed where the cross of Jesus stood. You continue once again, go down steps, and find yourself in front of a stone slab on the ground. A mostly female crowd is gathered around, where women are rubbing the stone with scarfs, handkerchiefs, and their hair. 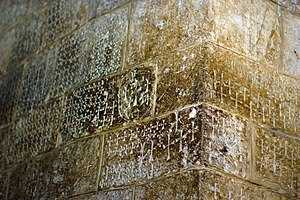 This is the “Stone of Anointing” where the body was prepared. However, the history of this item is less than 800 years old, and the stone itself has been there for less than 200 years. Our guide Etan led us to other parts of the building complex, including an unoccupied area where we could get a quiet view of the building archeology. There are many individual chapels within the complex, serving different needs, run by different sets of priests, some very simple and plain, some ornate and gaudy. Different sections are run by different groups (Latin, Greek, Coptic, Armenian) and due to the infighting and jealousies, the priests are not allowed in each other’s sections. The common areas were the gloomy ones – dusty, with burned-out light fixtures. When I asked, Eitan said that the common areas could not be touched unless all groups agreed, and then a neutral party – such as the Israeli government – would do the work. So no repairs or maintenance gets done and engineers fear the collapse of some sections of the roof. There is a semi-famous ladder that has been standing since the early 19th century, because the factions can’t agree on removing it. For me, the creepiest part was the tomb. A long line, complete with ropes (again, like an amusement park) snaked the tourists pilgrims to and fro, where they moved slowly, laughing and chatting, until they reached the door of the small building erected over the spot. Each person would take a candle, light it from the never-failing flame (? ), blow it out, then stoop and enter. Exiting, some would still be smiling and chatting, but others were in tears, and would stand silently outside for a few minutes. I didn’t wish to stand in line, so I passed this by. Later, I researched this, and found that the altar stone was deliberately broken at one time, to make the marble less valuable to thieves. 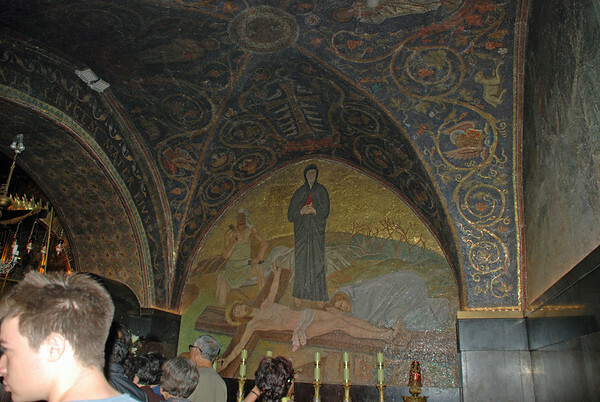 My take: most of the building dates from the time of the Crusades, and the surviving mosaics are mostly newer. Parts of the original building, erected in Constantine’s time, are still there, possibly over the remnants of a pagan temple. 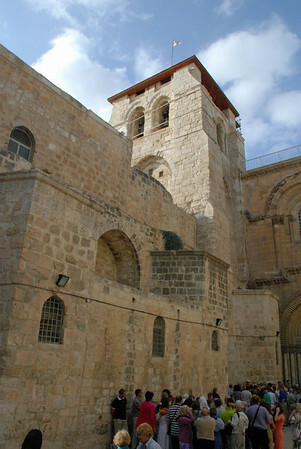 The location was captured and damaged or destroyed by other groups, including the Persians and the Muslims, captured by the Crusaders and then lost again to the Muslims. The Syrian Orthodox (an older church than either the Catholics or Greeks, with the oldest surviving intact liturgy) has a small dirty room with a very old wooden altar. They’ve not been allowed in to maintain the site in decades. And less you think that the violence between the different claimants is a thing of the past, just four years ago the Ethiopian church(which has largely been kicked out of the main church building) got into a fight with the Coptic group, which resulted in a dozen people injured. This fight was over the placement of a chair. The two groups sometimes have changed the door locks on each other. Of course, none of the hundreds of Protestant denominations have any presence in Jerusalem at all, except for one Lutheran church, which was allowed by the Ottoman Sultan as a favor to his friend, Kaiser Wilhelm of Germany. Not being religious, I went with an interest in history and archeology. However, I could not get any sense of holiness, reverence, or mystery. There are cracks and holes – and many have a ‘story’. This crack was from earthquake when Jesus died. This hole on the ground is where he stood. This is the chapel of the handcuffs (really). And I don’t see how anyone, knowing the real history of this place, with its ‘miraculous’ discovery by St. Helena, to the fighting and recent additions such as the stone, could come away feeling that they had been to a holy place, rooted in a true moment in time. I would love to go there and see the historic sights. You are lucky! In particular, I got a laugh out of the people taking all these chintzy trinkets and placing them on the anointing rock as if that somehow transfered magic properties to the trinkets. Exactly. I told someone that the Holy Selpuchre felt almost Disney. But dirty.